A jaundiced, dying man was brought to her on a stretcher. It was his last wish that he meet with her and be blessed by her gracious presence. "A lot of artists would not consent to meeting with a dying man," she said, "but I've been through enough in my life that I can relate to people very well. I'm not tough. I'm strong." In her case, tough describes a trait, strong depicts a virtue. Who is this woman who is the object of a dying man's final request? And what has she lived through that has given her such strength? Eilleen Regina Edwards was born on August 28, 1965, in Windsor, Ontario. Her parents divorced when she was just a toddler. Her mother, Sharon, then took Eilleen and the older daughter to live in Timmins, Ontario. There, in this poor mining town about 250 miles north of Toronto, she married an Ojibwa Indian, a father of two boys. The new family of six was reduced to five when Eilleen's older sister left home at 14. Eilleen thus became, in her words, "the older sister by default." The family experienced excruciating poverty and the children learned painfully well what it means to be hungry. Eilleen would take a mustard sandwich to school for lunch. Her indigence made her feel embarrassed and isolated. Tragedy struck when Eilleen was 21. Her mother and stepfather were killed in a head-on collision with a logging truck. The grim and numbing accident left Eilleen with custody of her two teenage siblings and the responsibility for raising them. Catholic poet Thomas Traherne asserted, "A Christian is an oak flourishing in winter." The adversity surrounding Eilleen's life made her strong. She abandoned her first name for the Ojibwa word Shania, which means "I'm on my way." She retained her stepfather's surname, Twain. In this way, she took the name by which her millions of fans know her Shania Twain. She was indeed "on her way." 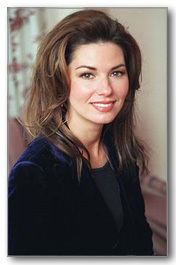 Shania Twain has become one of the most successful female singers in history. She is the first woman to have consecutive albums sell more than 10 million copies in the United States. She has won innumerable awards including the Country Music Association's "Entertainer of the Year" and a Grammy Award in 1999. She was also named the "Most Beautiful Canadian Woman of the Century." Shania has not allowed her fame and wealth to obscure her past hardships or lead her to ignore the hardships of others. Her compassion for others is as strong as she is strong as an individual. During some of her singing tours, she donates proceeds from each of her concerts to local charities that aid hungry children. "My goal," she states, "is to save kids the humiliation, the anguish of feeling inferior." Hers is the compassion that is worthy of the approbation of a St. Augustine. The Bishop of Hippo wrote in his Confessions: "Although he that grieves with the grief-stricken is to be commended for his work of charity, yet the man who is fraternally compassionate would prefer to find nothing in others to need his compassion." In helping to reverse the misfortunes of others, Shania is doing through music what Charles Dickens did through his novels. Her compassion for hungry children has not abated because, as she tells us, "I was that hungry kid." Shania Twain's most personal song is "God Bless the Child," and she has pledged all royalties it earns to children's charities. The original title of the song was less catchy, though more instructive of its message: "Hallelujah, God Bless the Child Who Suffers." The term compassion is commonly misinterpreted in our society to mean pity. The compassionate person, as the word indicates, suffers with the suffering person. And more than that, the compassionate person suffers for the suffering person. Pity causes a person to distance himself from the sufferer. There is no moral union between the one who pities and the object of his pity. Consequently, pity is inclined to end suffering by removing the sufferer. Compassion intuitively understands the redeeming value of suffering. Marie Antoinette, born and raised with an aristocrat's indifference toward the plight of her indigent neighbors, suggested that they "eat cake" when informed that they had no bread. Compassion is formed in the real and heartrending experiences of deprivation. Shania Twain's adversity formed her compassion and her strength, and it is to her honor and credit that it retains priority in her heart far above all the trappings of her extraordinary success. Donald DeMarco. "Strength and Compassion." Lay Witness (Nov/Dec 2001).